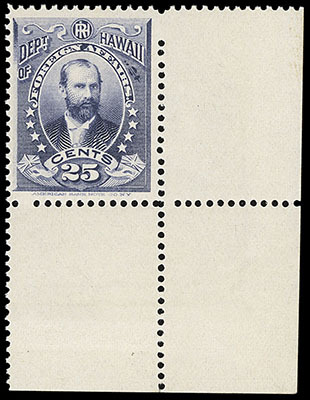 Hawaii, Officials, 1896, 2¢-25¢ complete, matched set of bottom right corner margin singles, o.g., never hinged, rich colors, fresh and F.-V.F. Hawaii, Officials, 1896, 2¢-25¢ complete, each tied on piece by full strikes of Foreign Office circular handstamps, rich radiant colors, Very Fine and attractive, much scarcer than Scott catalog would suggest. Scott No. O1-O6 Estimate $200 - 300. 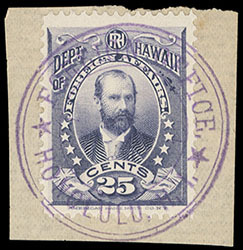 Hawaii, Official, 1896, 5¢ black brown, tied by "Honolulu, H.I. 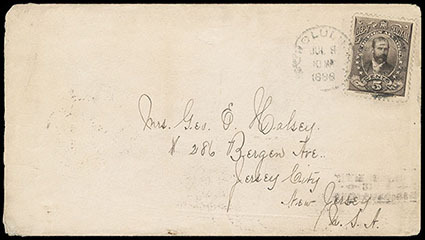 Jul 9, 1898" duplex on cover to Jersey City N.J., Jul. 21st receiving backstamp; some edge wear, F.-V.F. Scott No. 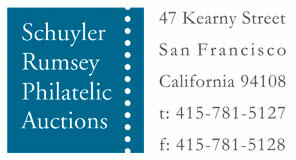 O2 Estimate $200 - 300. 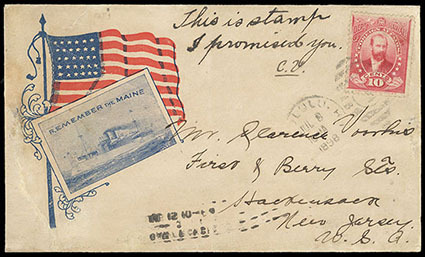 Hawaii, Official, 1896, 10¢ bright rose, tied by light "Honolulu, Jul 8, 1898" duplex postmark on red and blue "Remember the Maine" Spanish-American War flag patriotic cover to New Jersey, transit and receiving backstamps, Very Fine. Scott No. O4 Estimate $500 - 750.